Normally, I would like to give credit to the photographer, since it’s not the camera that’s taking the great photograph, but the genius mind of the photographer. This photograph, however, has a sad story in this sense. Not to be misunderstood, I still appreciate the photograph I’m going to present here. And certainly, I do give credit to the photographer. The only thing is I don’t know who the photographer is. I saw this photograph at the Modern Museum of Art in Barcelona (Museu d’Art Contemporani de Barcelona) in a limited time exhibit called “Praha, Paris, Barcelona: Photographic Modernity 1918-1948”. I was very lucky to run into this exhibit in my very little time in Barcelona to see this photograph which has had a direct impact in my vision of digital photography. Unfortunately, the little notebook in which I took notes about the photographs is at home and I have to write this post without being able to mention the photographer’s name. I apologize for this inconvenience, standing on the world wide stage of the web. As I was walking through the gallery, this particular photograph struck me at once. The image you see is very familiar, but at the same time different, weird and a little bit disturbing. It grabs your attention instantly and starts you to think of what the artist wants you to. It is a path very well directed through the impeccable ingenuity of the photographer. It is a silhouette of a man and a woman; however, the images cross over each other. It is a love story, obviously, possibly a sad one, as the man and the woman are looking at opposite directions, yet they are in one another. In other words, the two are essentially one. Who knows why they cannot be together; there can be a number of reasons, but the truth is that they love each other. Lovers forced to depart is a historically cliché story. However, it is very well put in this photograph, smartly and uniquely. As much as the story itself, the way how the photographer tells it interests me. The technique used in making this photograph is a well known dark room trick where you pose two photographs on one paper. 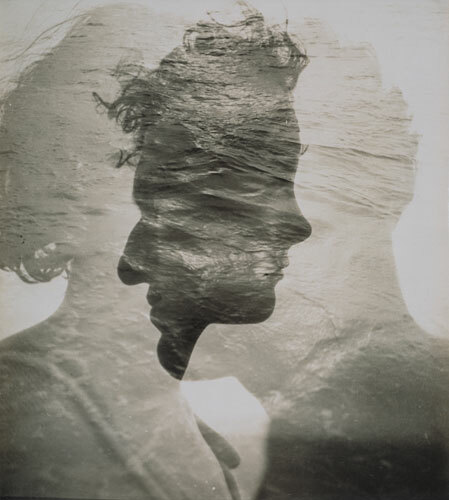 In this case, the photographer overlapped to partial silhouettes to obtain a complete silhouette, half of which is a man’s face and the other half the woman’s, looking at opposite directions. A couple words on why this photograph represents a milestone in my photographic journey. This photograph was altered, essentially, which in the digital world of photography directly corresponds to what most of us would instantly object: Photoshop. What is done in this photograph can be done exactly the same with the digital tools of Photoshop. This made me question if Photoshop was really something to stay away from or not. In analog photography, the images are posed on a chemical film and the films are post-processed in the darkroom. After all, digital photography is just an extension of analog photography in a world where technology takes over and anything that does not keep up with it is wiped away. Looking from this point of view, Photoshop is only an extension of the darkroom, to post-process in the computer rather than the darkroom, the images that are posed on a sensor rather than a chemical abstract. To me what is shown on this photograph is father and his daughter. Face of the girl looks like a face of a child: look at proportions, small nose, small lips. They are one, ofcourse, but they have different lives. They are visible on the common part of the photograph. Together they are strong, but it will not last forever. The daughter will find another man for her life. She will grow up and leave him. He will grow old and leave.